Starr X Plain Stainless Steel Wall Mount Opener and the Starr X Stainless Steel Cap Catcher sold as a set. Regular Starr X openers are made of zinc plated cast iron, this one is made of unpolished stainless steel. Cap Catcher is brushed stainless steel. Great for outdoor locations but looks great indoors too. 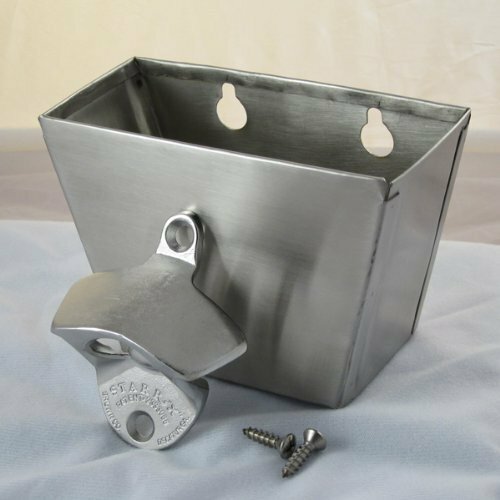 Mount Cap Catcher about 7 inches below Opener for best results. Catcher holds about 75 caps and is removable for emptying and washing. By chen gui jin ke ji Co.,Ltd.